Home DIY Projects	Carved Frames FIY = frame-it-yourself! I love artwork, especially when it comes in beautifully carved frames. As we all know this can be quite expensive. I’ve found a few tricks over the years to affordably add pretty and unique art to our home without breaking the bank! 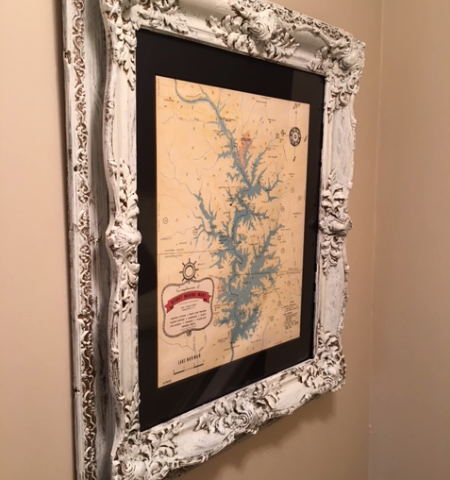 First and foremost, if you ever run across a great frame at a good price, buy it! Even if it needs a little repair work or paint it is well worth it. With websites like Posters.com or Allposters.com you can buy a print to fit the size of the frame and then have a piece of glass to cut to fit. I am lucky I have a great frame store in town that will basically help you frame it yourself. They charge a small table fee and then they will walk you through the entire process. When you walk out, you have a perfect piece ready to hang. Another trick I like it buying artwork at consignment stores or Goodwill. Usually they have the frame, glass and mat and all that is needed is to switch out the artwork or picture. I found a nice gold frame at the Goodwill a while back. I believe it was $10. I liked the size of the frame and the mat color. (I think it was a picture of a tree.) I wanted something “lakey” and I found this picture of a heron on Allposters. It fit perfectly! It reminds me of a heron we call Big Bird that likes to fish off of our dock. (Lacey’s nemesis). I’ve used this same trick for my shrimper, a lake map (see at the top) and my beloved Gertrude, too. I have a few more frames in my stash that I’m working on currently. I’ll share those when I’m done. Thanks for stopping by! Globe as a Wedding Guest Book!